The designer, suitmaker and shopkeeper Sid Mashburn once said of a man’s wardrobe: “Guys don’t need a lot of options, they just need the right options.” And for the most part, we’re inclined to agree. Contrary to what most chart-topping rappers would have you believe, it’s the simple, timelessly stylish pieces worn right that make you stand out. Which is why most guys could have a wardrobe stocked with as few as 19 items and still be considered better dressed than 90 per cent of the population. But Mr Mashburn’s theory doesn’t really stand up when applied to colour. Here, most men tend to be a little too reserved and conservative. We all know how relatively easy it is to pull off neutral looks made up of black, white, navy and grey, but if you really want to stand out from the pack, it’s time to start embracing bolder hues. So if you’re still wandering around in the dark, here are the six most commonly swerved shades and how to wear them all year round. Still hung up on pink supposedly being for girls? Then consider this: it’s no myth that until the end of the 19th century pink was – in the Western world – actually thought of as a masculine hue. Connotations of girlishness gradually came in the early 20th century as marketers repositioned pink as a feminine colour. Whether dusty and soft or bold and bright, pink has been big news for several seasons now. And the shade is not about to fade away anytime soon, if our menswear experts are anything to go by. Lucky, then, that it pairs well with plenty of colours you probably already have in your wardrobe – including brown, beige, blue, white and darker shades of green, such as olive. That said, wearing pink does come with its caveats. If you have fair skin, you should be wary of wearing pastel shades close to your face as it can wash your complexion out. If this is the case, try balancing it with darker colours – for example, a pink dress shirt with a navy blazer and blue tie. Another option is to try a bolder, richer tone of pink instead. An Oxford shirt is arguably the most versatile piece you can opt for in pink, as it teams well with everything from a brown tweed blazer and indigo jeans to a grey suit. Pink chinos or shorts are another great addition to your summer wardrobe, while pink socks can add the perfect pop to an otherwise understated outfit. These guidelines have been derived from the standard colour wheel. We will also offer some FashionBeans-approved recommendations. Similar Colours (Easiest To Pair): Reds and mauve pinks. Contrasting Colours (Harder To Pair): Blue violets and yellow greens. Complementary Colours (Hardest To Pair): Blue greens. Recommended: Brown, beige and white, along with darker shades of green and blue. We know what you’re thinking, why would Pantone make a hard-to-wear shade its Colour of the Year? It’s not some cruel joke of the fashion industry, in fact the colour bods have done us a favour. While most of us are no strangers to moss or khaki hues, there are so many other green tones that can be introduced to your wardrobe and help take your outfits to the next level. No matter what shade you opt for, this masculine colour always looks best paired with blue, white and grey, while darker military variants complement similarly earthy hues such as brown and mustard. As for what you should look to invest in, green is arguably the easiest and most versatile on this list to pull off. The only real consideration to be made is skin tone. Those with pale/fair skin should stick to deeper shades like bottle green, while anyone with an olive/medium complexion just needs to avoid shades too close to the skin, such as olive. Finally, guys with darker complexions have the pick of the lot, along with the added benefit of being able to wear bold, bright hues like jade green. 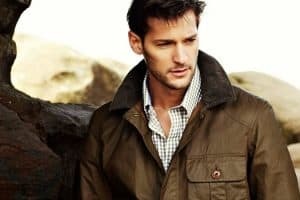 Once you’ve figured out the perfect shade for you, look to pick up a couple of pieces that will serve you well now – chiefly outerwear and chinos or cargo trousers – then follow up with short-sleeved shirts and shorts during the warmer months. Aside from tailoring, a year-round green option can be found in the form of accessories (socks, lightweight scarves, pocket squares, etc. ), which will add a point of interest to an otherwise pared-back look. Similar Colours (Easiest To Pair): Yellow greens and blue greens. Contrasting Colours (Harder To Pair): Reds and violets. Complementary Colours (Hardest To Pair): Mauve pinks. Recommended: Blue, white and grey. Although brown tends to remind us of the less than savoury fashions of the 1970s, attitudes have been changing in recent seasons thanks to designers making full use of it in their collections and the resurgence of fabrics like shearling. Despite not appearing on the colour wheel, the perfect partner to this classic neutral will always be blue. The pairing gives blue depth, while the brown appears richer. Additional colours that combine well include earthy hues such as burnt orange, green, khaki, mustard and beige. Although there’s a shade of brown that will work well with pretty much every skin tone, those with olive or dark complexions will want to avoid hues too close to the colour of the skin as it can make it appear dull and faded. Brown is likely already present in your wardrobe in some – albeit small – way, so why not try upping your quotient with some tan corduroys or chinos, a chocolate brown leather jacket, dark camel merino crew neck jumper or even a simple pair of russet brogues or desert boots? Recommended: Blues and earth tones. Orange may remind you of Halloween, but it needn’t be a horror story when it comes to pulling it off. The traditionally bright, citrusy shade has taken on a more burnt appearance in recent seasons, making it more cool than costume-y. While many wrongly wait for summer to reclaim orange from Dutch football fans, the autumn/winter months are in fact the perfect time to start putting the hue to work. Ease in by adding a jolt of colour to a standard grey or navy suit with a tie or pocket square, before graduating to knitwear and even coats. Of course, the hi-vis look is not for everyone. Fortunately, there’s a complete spectrum of shades on offer: from almost-brown rust tones for pale skin, to bright coral and blood orange for darker complexions. However you wear it, be sure to add balance to any look by off-playing orange against neutral colours such as grey, navy and black. Similar Colours (Easiest To Pair): Reds and yellows. Contrasting Colours (Harder To Pair): Mauve and blue greens. Complementary Colours (Hardest To Pair): Blue violets. Recommended: Earth tones, as well as grey, navy and black. The most regal of all hues according to the Ancient Romans and Greeks, purple is often one of the first colours men try when looking to expand their palette. That said, many frequently get it wrong. The easiest way to wear purple is to use it sparingly as an accent – wearing it head-to-toe just screams Batman villain. It teams extremely well with beige, grey and shades of blue, from sky and duck egg to cobalt and teal. Providing you opt for a shade that’s either a little brighter or darker than the middle ground, like magenta, purple works best on those with olive or medium skin tones. Ties and pocket squares in purple are the ideal pieces to start with; combine them with suits in neutral colours and light-coloured shirts for maximum effect. Purple dress shirts also look great when paired with navy or midnight blue suits, and for the especially ballsy amongst us, why not consider a purple blazer or a pair of chinos for the summer months? Each is guaranteed to make a statement. Similar Colours (Easiest To Pair): Blue violets and mauves. Contrasting Colours (Harder To Pair): Reds and greens. Complementary Colours (Hardest To Pair): Yellows. Recommended: Navy, grey, white and beige. Yellow is notoriously difficult to wear and often avoided, even by menswear’s most daring. Like orange and purple, yellow is a statement colour that needs to be used sparingly and anchored with neutrals. With this in mind, always look to control use of the hue with surrounding pieces in white, blue, grey, beige and charcoal. Perhaps more importantly, though, is finding a shade that doesn’t wash you out – especially if you’re of a fairer skin tone. While darker skin types will be able to pull off everything from corn flour to canary yellow, pale men need to be slightly more cautious. If this applies to you, try darker hues like mustard and gold, which should help lift your complexion. As with green, those with olive skin should avoid anything too close to their skin colour or risk blending in with their clothing. Casual separates like cotton polo shirts, T-shirts, jumpers and shorts look great in yellow, particularly when combined with blues. If you feel like upping the ante, embrace your inner Nick Wooster and opt for a pair of statement shoes or trainers. You’ll be surprised how versatile they can be when teamed with dark denim or grey flannel trousers. Similar Colours (Easiest To Pair): Yellow greens and oranges. Contrasting Colours (Harder To Pair): Blues and mauve pinks. Complementary Colours (Hardest To Pair): Violets. Recommended: Neutrals – particularly white, pale grey, charcoal and navy.